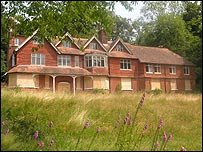 An urgent appeal has been launched to pledge support for a multi-million pound project to secure the future of Sir Arthur Conan Doyle’s home, Undershaw at Hindhead in Surrey. 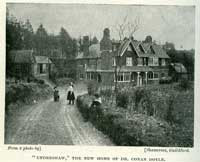 Undershaw was built by Conan Doyle for his invalid wife Louise in 1897 but despite its history in recent years it has fallen on hard times. Temporary protection work has been carried out because of vandalism and the theft of the lead roof. The current owners want to convert the original building into three houses and demolish the extension and replace this with a new wing of town houses. Until 2004 it was a hotel and restaurant. In 2004 the Victorian Society tried unsuccessfully to have the building Grade I listed. Now the Hindhead Together Appeal is testing the public support for a plan to persuade the National Trust to purchase, repair, restore and maintain the building as a visitor and heritage centre open to the public. If you want to pledge your support to the campaign then please add your signature to the petition to save Undershaw. It was, of course, at Undershaw where Arthur and I discussed the publication of The Hound of the Baskervilles.